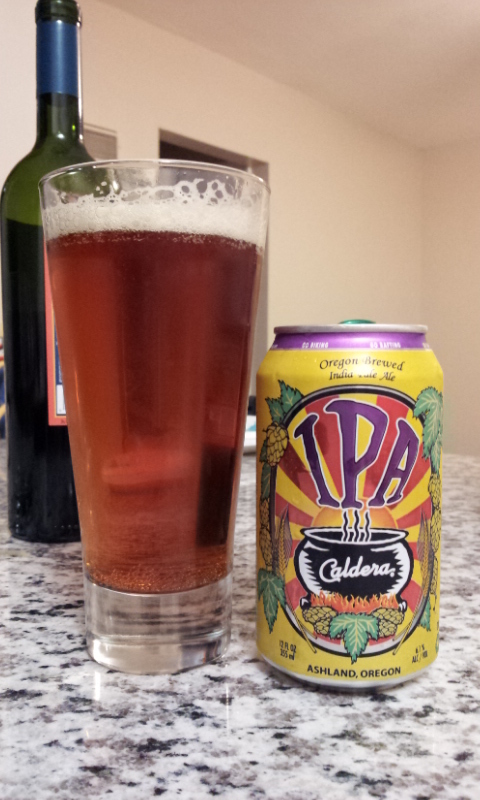 The canning trend continues, this time with an IPA from Oregon. According to my top-secret sources Caldera has been canning since 2005, and was the first brewery in Oregon to do so. And it's been shown already that there's nothing wrong with good beer in a can. In fact, the best IPA I've had in a while, Happy Camper, was also in a can. But for a style like IPA, where aromatics are so important, don't expect that drinking it out of the can will provide the same experience as drinking it out of a glass. This beer is no exception to that rule, but it turns out to be not too big a deal. The color is wonderful, and the flavors remind me of the Southern Tier, with the same ultra-high IBU paired with a serious lack of moistness (it's dry is what I mean). The obviously muted alcohol content, though, makes your mouth feel like it's had a blast of cold, dry, winter air. So it's wholly enjoyable, but will probably give you severe cottonmouth if you drink more than--oh, let's say--eight. The can instructs us to go biking, rafting, skiing, fishing, and snowboarding. But, honestly, can we not even enjoy outdoor sports without beer? Of course we can. What they really mean is once you're done doing all those things (all you hyper-active sporting folk) you should have a beer -- this beer. I'll certainly agree to that. Self-proclaimed +1 for using 'moist' to describe a beer. Labels: Ashland, Caldera Brewing Co., IPA, Oregon, Southern Tier Brewing Co.